Wenn man im Visual Studio den Debugger an den IIS hängt kommt vorher ein Warnhinweis. 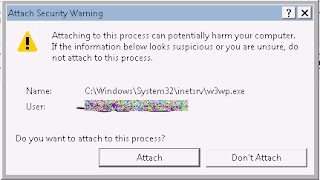 Disable warning-messages when attaching VS to iis/w3wp. When you attach VS to iis/w3wp for debugging, VS displays a warning. This script disables theese warnings by modifying the registry accordingly. WARNING: Make sure VS is not running when you start this script! continue script execution, even if a running VS is detected. Write-Host "$($versions.Length) VS installations found in registry: $versions"
New-ItemProperty $basePath -Name $key -Value $dword -PropertyType "DWord"
Das Skript kann für eine bestimmte Version (z.B. mit "-VsVersion 10.0") oder einfach für alle Versionen ("-AllVersions") aufgerufen werden.